Double XP and new events when, Aura? check my PM me again. Aura pls respon my PM. What happened to the GM's twin saga? Aura chan if you close the thread then how do you actually expect me to answer your question? first of all, if someone hacks and used my character or account is the case of scamming others there I am not responsible for that as long as I don't share my account password or something which I didn't. And about your last question, you said Aura can check your private message. 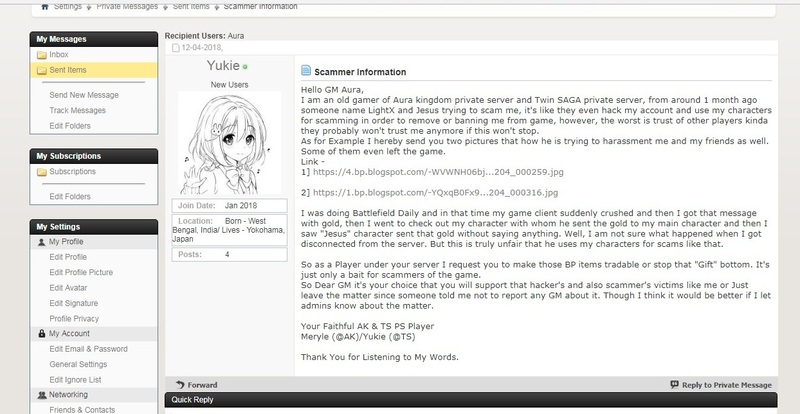 Btw it's not like I am blaming any Admin or you for this matter because in many other games it usually happen, but since AKPS was really a clear server from start I actually wasn't so ready to get something like this or you can say I am still I bit confuse but I still can say in my life I never at least scammed anyone. Hi Aura please respond to my pm please thank you.